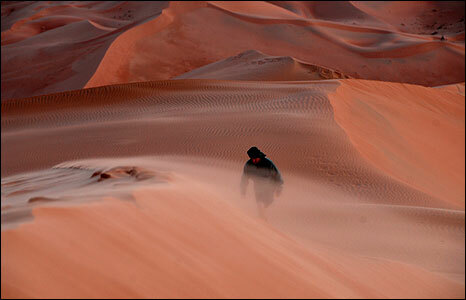 British teacher Mark Evans and New Zealand photographer John Smith spent four weeks exploring the desert in Oman's Empty Quarter. The pair started near the border of Yemen, Saudi Arabia and Oman, and travelled north-east towards the famous Umm al-Samim quicksands. 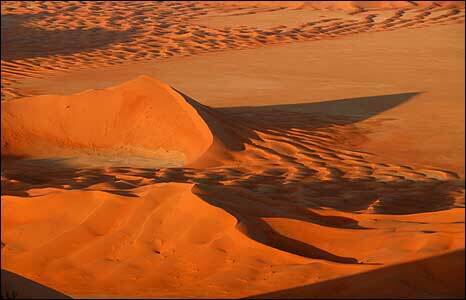 This shows the approach to the summit of Oman's highest dune. They spent time with people in desert communities. 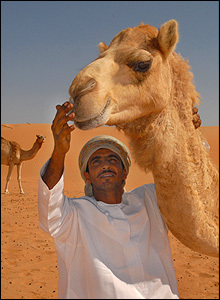 This camel has won Oman's revered 'Most beautiful camel' award. Her owner, Sheikh Mohammed, lives in a small settlement 1km from Saudi Arabia. Offering hospitality to travellers is still a key part of desert culture. The pair made their journey by car, but they slept under traditional Bedouin tents. This was the view from within the tent one night. 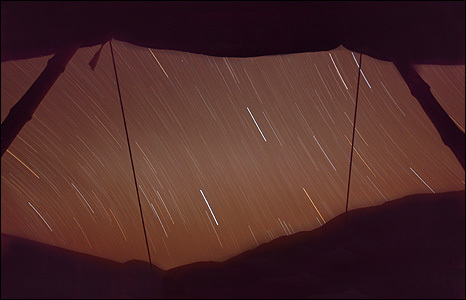 The total lack of light pollution made star trails visible. 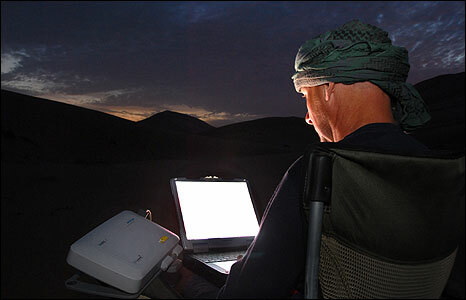 In spite of their remote location, Mark was able to add to his daily online diary every evening. He also uploaded the best of John's photographs from each day. 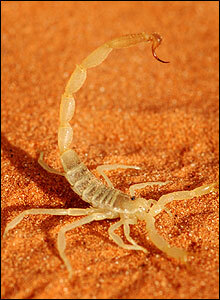 This scorpion was the fifth they saw running around their tent in one 24 hour period. Spiders and snakes were also regular visitors to the camp. 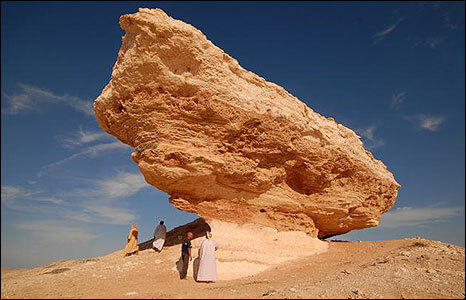 This distinctive rock, called Howgah Harasis, was once a well known meeting point for travellers in the Omani desert. It can be easily spotted from far away. The overhang provides shade and shelter. The view looking north from the third highest dune in Oman. 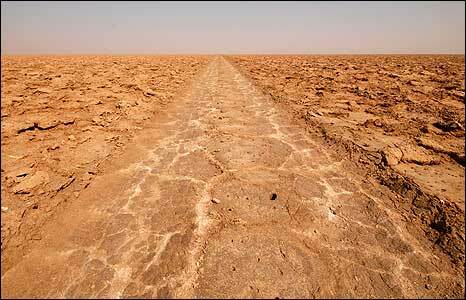 The blue colour in the distance indicates the treacherous quick sands the travellers headed for. 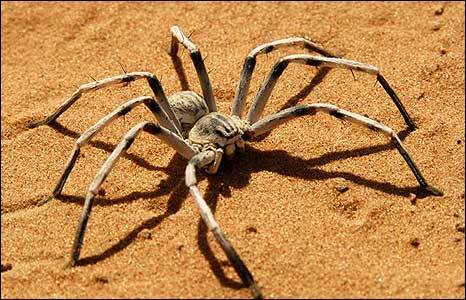 Umm al-Samim, the mother of poison quicksands. 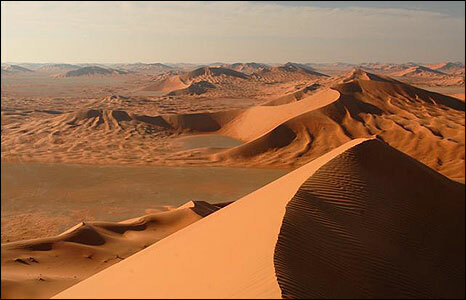 British explorer Wilfred Thesiger claimed to be the first European to reach these quicksands in the 1940s.